The D&N was founded in 1877 as the Durham Diocesan Association to preserve and develop the art of "full circle" bell ringing across the parishes of Northumberland and Durham, at the time these were all in the Durham Diocese. In 1882 following the creation of the Newcastle Diocese by splitting the Durham Diocese in two the "& Newcastle" was added to the Association name. Geographically the D&N covers a large area roughly east of the pennines stretching from the River Tees in the south to the Scottish Border in the north. 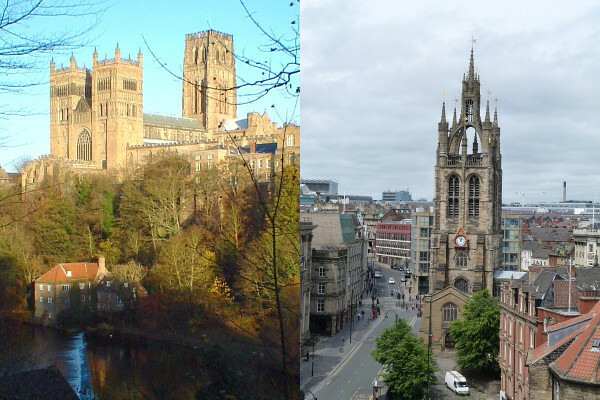 This region is home to two World Heritage Sites, Durham and Hadrian's Wall. It also possesses areas of outstanding natural beauty in the valleys of the rivers Tyne, Wear and Tees, the Cheviot Hills and the Durham and Northumberland coastlines. If you are not familiar with the area have a look at some of the local links and you might be surprised at what it has to offer. The D&N is split into three districts on a geographical basis, each district has its own officers who organise events at the district level. The General Officers oversee the running of the Association as a whole and organise Association level events. New recruits are always welcome and you will be able to learn at a tower not far from where you live. Bellringing is a hobby for all, the Association has members ranging in age from 10 to 90+ and from all walks of life. It provides non-strenuous physical exercise and a moderate amount of mental exercise too, it also provides the opportunity of a good social life. If you think you may be interested in learning to ring or would like to find out more please contact Joanne Ayre by email with your name and location. She will get back to you as soon as possible with a view to putting you in contact with someone local to you.